Well here we are - our first sneak peek for the Inspired by Stamping December Stamp Release. 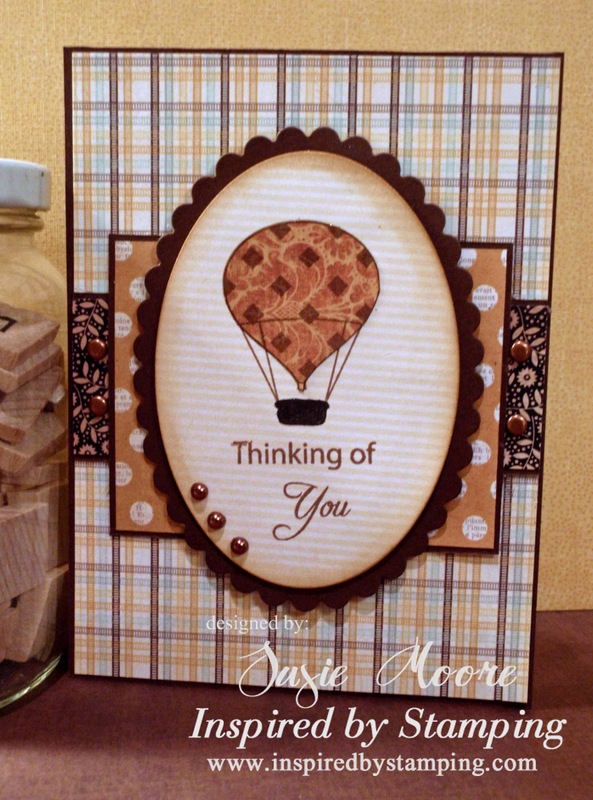 Joanna has designed the cutest ever set of hot air balloons and sentiments. Be sure to pop on over to her site because she is having a giveaway and the winner could be YOU. I made today's card using this new stamp set, The Sky's The Limit and papers from My Minds Eye Sunshine paper pad. I used the oval dies from Spellbinders for my focal image and of course I wanted to paper piece that hot air balloon. I love the way it turned out! And tomorrow I am coming right back here with another sneak peek. So I'll see you then. Very pretty, I really like the colors you used! Fun layout as well. Good morning Susie!! Love the warm hues of your card! The classic layout works so well with this set! Love it!! Looking forward to designing with you! I adore the colors! And the swirl pattern on the balloon is gorgeous! Beautiful Card Susie! I love all the rustic colors! A perfect masculine card too! Beautiful job!!! That card is gorgeous, as always Susie!! I love the little hardware, is kind of masculine, very pretty!! Great Sketch too! Susie, what a pretty card! I love it!